The 'Application Settings' allow you to edit various settings that apply across the entire App. Most settings don't need editing. 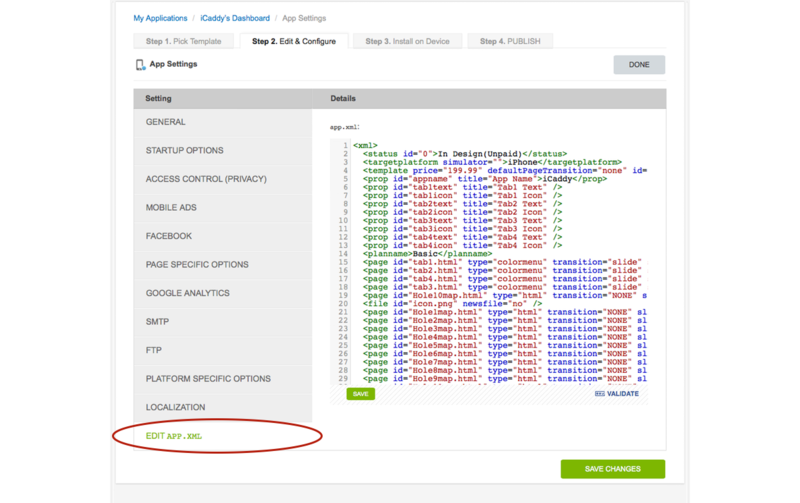 From the Application Dashboard, select the 'Application Settings' option (as shown in the image above). After selecting this option, a list of Settings is displayed on the left side of the page (as shown in the image below). The following information explains each of these settings in detail. The 'General' settings includes the ability to change the number of tabs displayed at the bottom of your App (e.g. Club House, Course etc.). The number of tabs can be edited via the corresponding drop-down menu. The 'Enable App's Rotation' check-box enables the device (on which the App is being displayed) to rotate sideways, with the page displayed vertically. 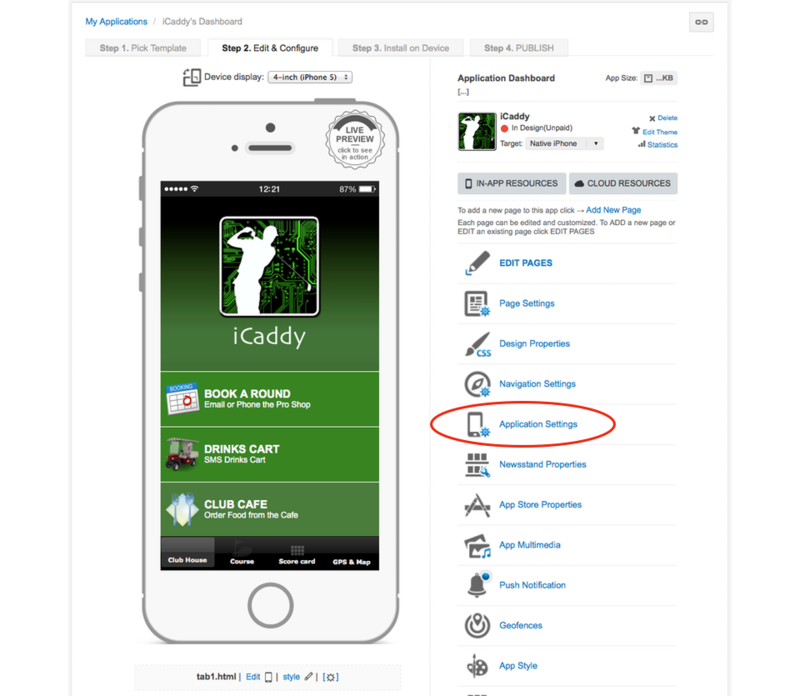 This setting is not enabled by default, noting that the score card and hole map pages in iCaddy templates are not designed for use in landscape view. We recommend leaving this setting disabled. Note: Leaving the rotation disabled will not prevent hole fly-over videos from being viewed in landscape (i.e. with the device rotated). The 'Enable Webview Bounces' check-box and the 'Share Link' setting are not required to be edited on any of the iCaddy templates and should only be edited by advanced users. Note: None of the General settings need to be edited for a normal iCaddy Build (i.e. when using an existing iCaddy template). 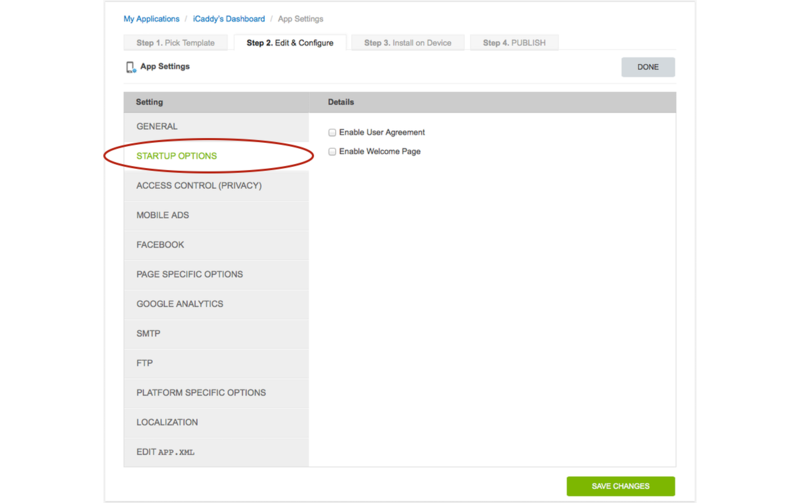 The 'Startup Options' allow you to enable a 'User Agreement' which is displayed the first time a user opens your App. The user must then agree to your 'terms & conditions' before using the App. The User Agreement will not be displayed again after a user has accepted the 'Terms & Conditions'. If you select the 'Enable User Agreement' check-box, a new page will be added automatically to the 'Edit Pages' list where you can customize a User Agreement for your Club. 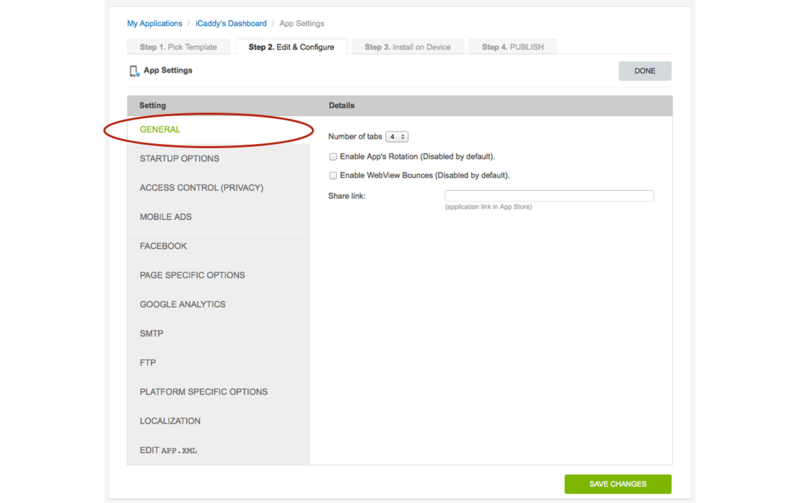 The 'Enable Welcome Page' setting enables a Welcome Page which will be displayed every time a user opens your App. If you select the 'Enable Welcome Page' check-box, a new page will be automatically listed in the 'Edit Pages' list where you can customize a Welcome Page for your App. Note: None of the Startup Options settings need to be edited for a normal iCaddy Build (i.e. when using an existing iCaddy template). 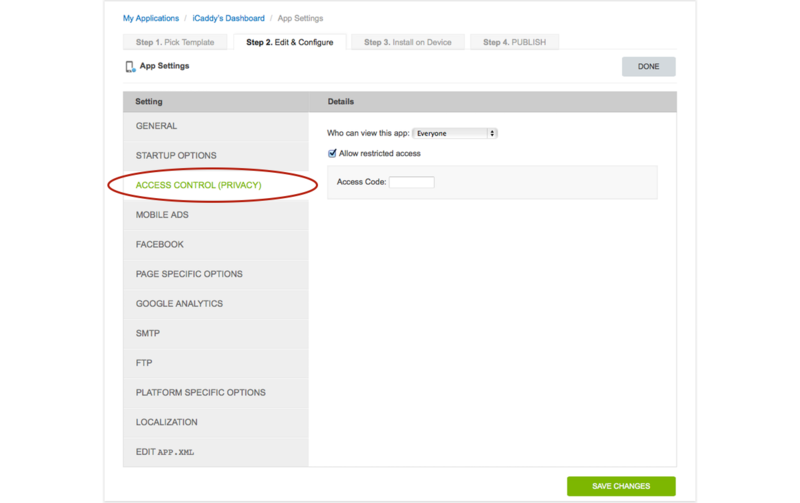 This setting allows you to restrict access to your App in the iCaddy Previewer. An 'Access Code' can be set which must be entered before access is provided to the user in the Previewer. Note: This function is only for advanced users and it is not required to be edited to view your App in the iCaddy Previewer. We recommend leaving the default settings unchanged. 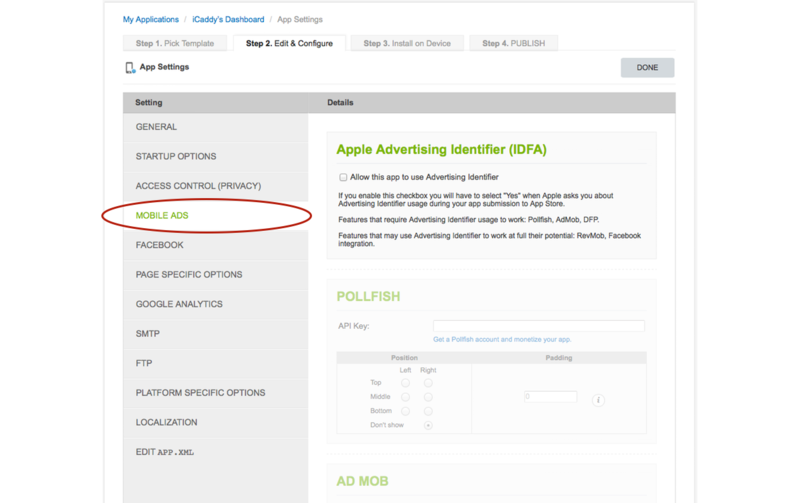 These settings are related to In-App (pop-up) advertising arrangements and are provided only for advanced users & developers who intend to incorporate In-App advertising pop-ups and publish Apps using their own Developer Account(s). These settings should not be edited in all other instances. This setting allows you to enter a Facebook App ID if you have a Facebook App. 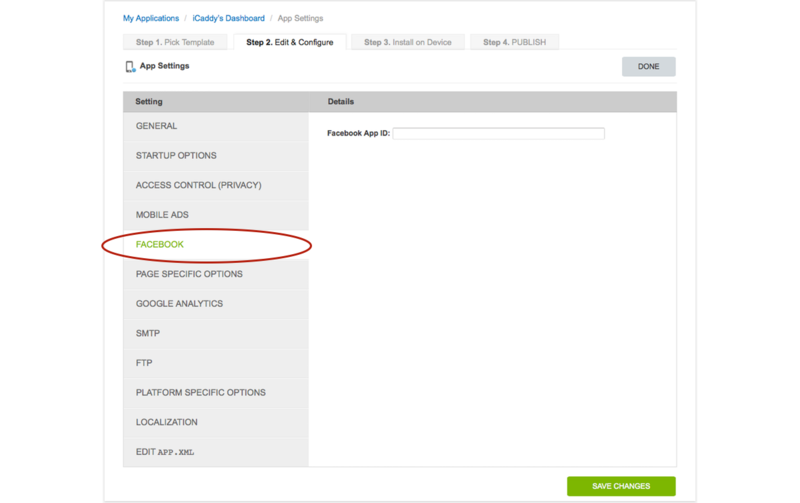 Facebook Apps must meet the requirements of the Facebook Platform Policy. Please note that iCaddy Apps do not provide support for Facebook Apps. This setting is not required for a standard iCaddy build and we recommend leaving this setting blank. Note: This setting is not required for a normal iCaddy build (i.e. when using an existing iCaddy template). Thses settings enable you to use 'PDFTron' and 'Sharepoint' in your App. Note: These settings are provided for advanced users only and are not required for a normal iCaddy build. We recommend that you leave the default settings unchanged. This setting is related to the publication of your App and can be completed by iCaddy Apps on your behalf, if required (in accordance with normal publishing arrangements where your App is published under our developer account). 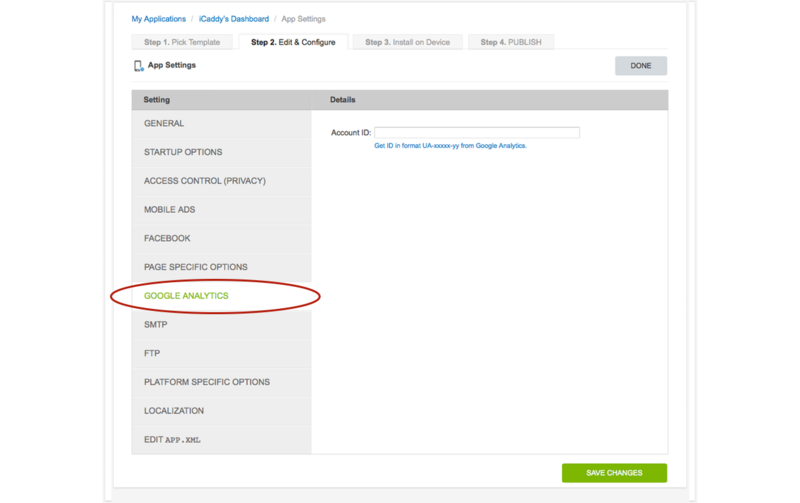 If you plan to publish your App under your own developer account, you must insert your Google Analyitics Account ID in the relevant field. Note: This setting is not required for a normal iCaddy build and is recomended for advanced users (developers) only. 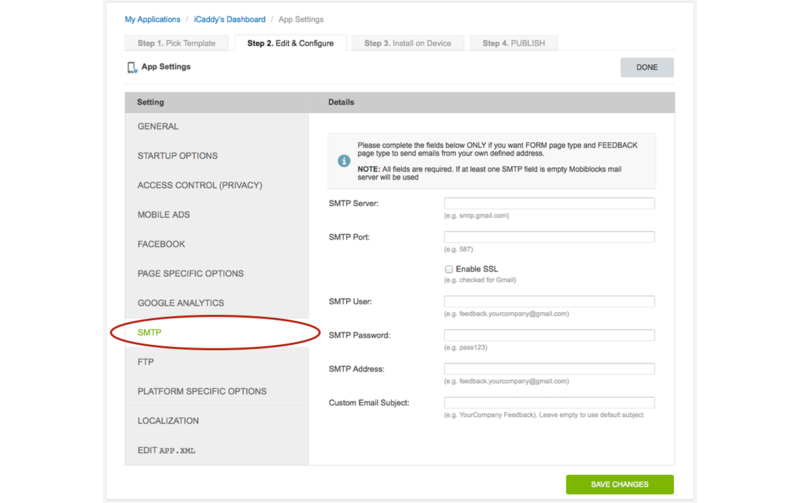 The 'SMTP' settings provide advanced functionality for 'Form' and 'Feedback' page types. Editing these settings enables these page types to send emails from a defined address. Note: These settings are not required for a normal iCaddy build and are recommended for advanced users only. We recommend leaving these setting blank. 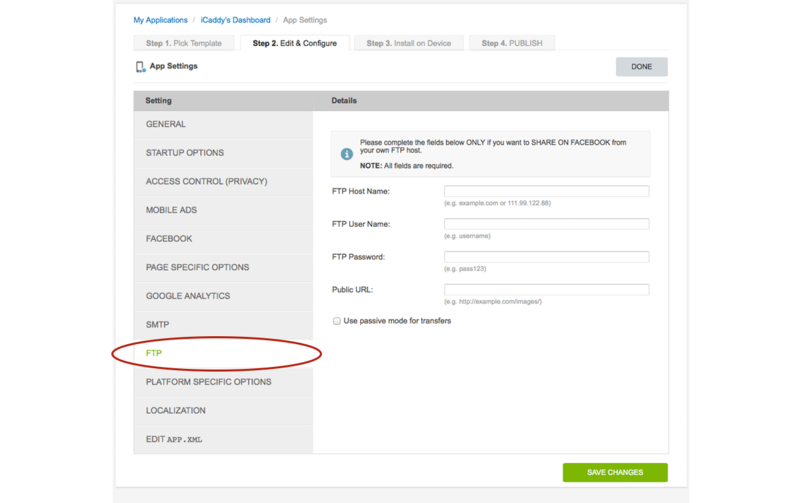 The 'FTP' settings allow you to 'Share on Facebook' using your own FTP host. The 'Platform Specific Options' settings relate to 'In-App Purchasing' and 'App-Rating' arrangements. 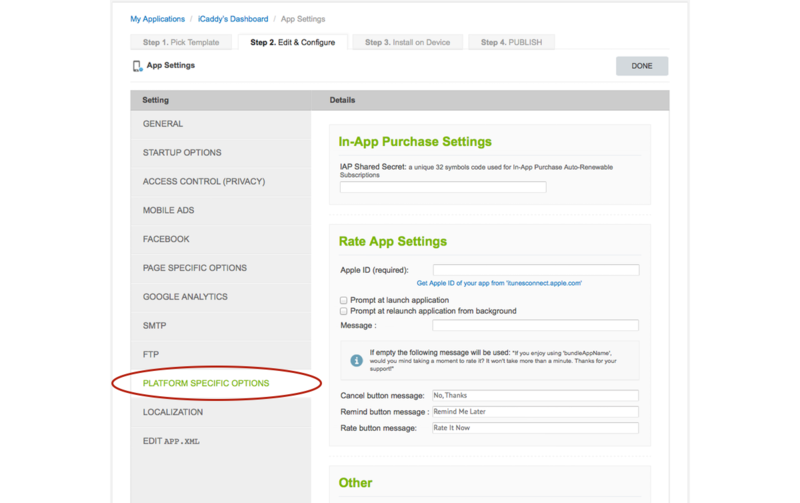 The 'In-App Purchase Settings' are provided only for developers who intend to establish In-App Purchasing and publish Apps under their own developer account(s). These settings should be left blank for a normal iCaddy build. The 'Rate App Settings' allow you to set up a prompt which asks the user to rate the App (e.g. each time the App is launched). The Apple ID for the App is required to enable the App-Rating feature. 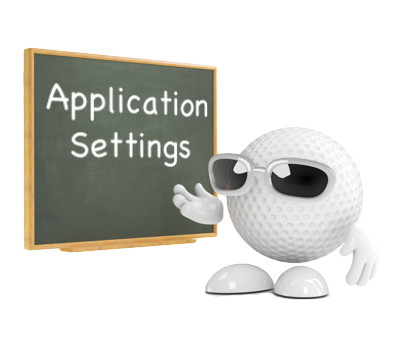 We recommend leaving the 'Rate App Settings' blank, however iCaddy Apps can assist Clubs' to enable this feature is required. Note: The 'Platform Specific Options' settings are not required for a normal iCaddy build and are recommended for advanced users only. 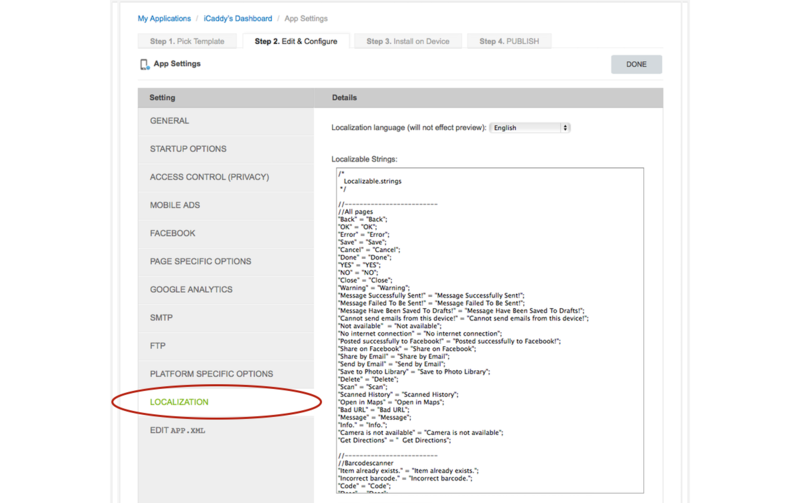 The 'Localization' settings contain 'localizable strings' which are specific to various page types. The 'localizable strings' represent specific messages and text which is displayed when using the App. These settings are not required for a normal iCaddy build and are for advanced users only. Warning: Editing these settings may cause App instability. We recommend leaving all localization settings unchanged. The 'EDIT APP.XML' settings contain content which should not be edited as part of a normal iCaddy build. The 'app.xml' file provides an overview of the particular framework and content specific to each App. Access to the 'app.xml' file is provided for advanced users only. Warning: Editing these settings may cause App instability or failure. Do not edit the 'app.xml' file unless specifically requested to by iCaddy Apps.